Natalie Kokta, PharmD Candidate, Mylan School of Pharmacy, Duquesne University, Pittsburgh, PA. According to the Centers for Disease Control and Prevention (CDC), “Antibiotics are a shared resource—and becoming a scarce resource.”1 In 2013, the CDC estimated that more than 2 million illnesses and 23,000 deaths were caused by antibiotic resistance.2 The most modifiable component of complications caused by antibiotic resistance, which leads to increased healthcare costs and poor health outcomes, is antibiotic use. It is estimated that up to 50% of outpatient antibiotic prescriptions are inappropriate,2 and are most often indicated for acute respiratory infections. With these statistics on the rise, antibiotic resistance is one of the world’s most pressing health concerns, with cause to limit misuse and overuse of antibiotics. The National Action Plan for Combating Antibiotic-Resistant Bacteria is a plan designed to guide the United States in rising to the challenge of combating the pressing threat of antibiotic resistance.3 This plan was developed in response to President Obama’s Executive Order 13676: Combating Antibiotic-Resistant Bacteria. Slowing the emergence of resistant bacteria and preventing resistant infections from spreading is the first goal listed in the plan.3 This goal includes practicing antibiotic stewardship interprofessionally to improve prescribing practices across all settings in healthcare, including the outpatient community pharmacy. Listed below are a few opportunities that community pharmacists can take advantage of in their practice settings to contribute to the fight against the war on resistance. Keeping up to date with current practice guidelines and recommendations for appropriate antibiotic prescribing in adults and children who are seeking care in the community setting is of great importance. By doing so, pharmacists can act as the “gateway practitioner”6 to intervene and prevent unnecessary antibiotic use, and improve antibiotic stewardship. The CDC offers quick reference tables7 for practitioners (see www.cdc.gov/getsmart/community/for-hcp/outpatient-hcp/index.html). 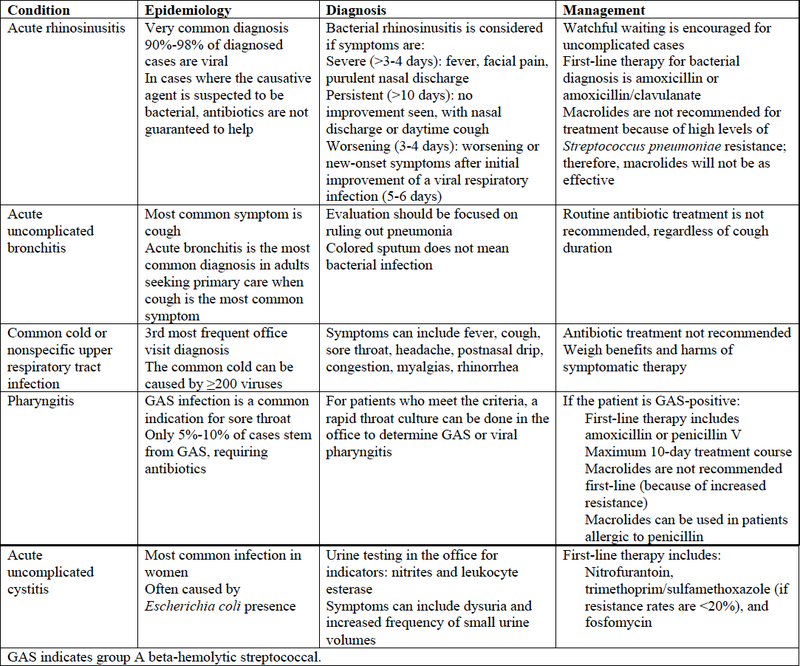 Table 1 summarizes the CDC reference table for adult patients. Source: Centers for Disease Control and Prevention. Adult treatment recommendations. Updated March 4, 2016. www.cdc.gov/getsmart/community/for-hcp/outpatient-hcp/adult-treatment-rec.pdf. Pharmacists are key healthcare educators in the community. Education is a large component of pharmacist-led outpatient stewardship, as studies8,9 have suggested that patient expectations can influence prescribing habits. 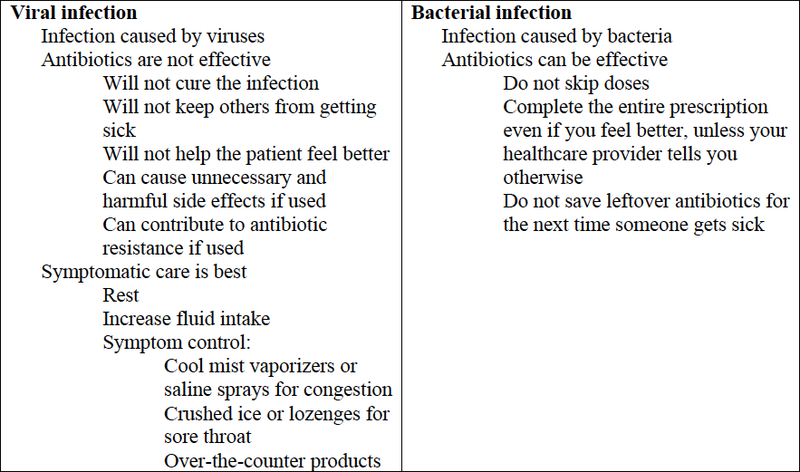 Pharmacists have the unique opportunity to include education on antibiotic resistance and stewardship during regular patient interventions already incorporated into their regular workflows. Source: Centers for Disease Control and Prevention. Antibiotics aren’t always the answer. Updated November 14, 2016. www.cdc.gov/features/getsmart/. Aches and pains can be relieved through the use of nonsteroidal anti-inflammatory drugs (key active ingredient, ibuprofen). By screening patients during normal workflow in the community, pharmacists have the ability to identify patients in need of vaccination, and can vaccinate those in need that day because pharmacists are now able to vaccinate in every state. To slow the progression of antibiotic-resistant bacteria, all healthcare professionals must work collaboratively and contribute as individuals. We all have a responsibility to assist in the war on antibiotic resistance as stewards in each healthcare setting, especially in the outpatient community. As frontline practitioners, pharmacists especially have a role to play as educators and vaccinators. Without interprofessional treatment protocols for bacterial infections, antibiotics available for use will continue to decrease because of increased antibiotic resistance. It is vital that we collaboratively take a stand against resistance and limit antibiotic use today to prevent larger problems tomorrow. Ms Kokta received a grant from the Pennsylvania Pharmacists Association. Centers for Disease Control and Prevention. Appropriate antibiotic use – saves lives, saves money, makes sense. November 17, 2010. www.cdc.gov/getsmart/healthcare/resources/factsheets/pdf/antibiotic-use.pdf. Accessed October 2016. Centers for Disease Control and Prevention. About antimicrobial resistance. Updated September 8, 2015. www.cdc.gov/drugresistance/about.html. Accessed October 2016. Task Force for Combating Antibiotic-Resistant Bacteria. National action plan for combating antibiotic-resistant bacteria. March 2015. www.whitehouse.gov/sites/default/files/docs/national_action_plan_for_combating_antibotic-resistant_bacteria.pdf. Accessed October 2016. Infectious Diseases Society of America. Promoting antimicrobial stewardship in human medicine. 2016. www.idsociety.org/Stewardship_Policy/. Accessed October 2016. Centers for Disease Control and Prevention. Leaders committed to antibiotic stewardship. Updated December 7, 2016. www.cdc.gov/drugresistance/federal-engagement-in-ar/stewardship-commitment/index.html. Accessed October 2016. McCoy D, Toussaint K, Gallagher JC. The pharmacist’s role in preventing antibiotic resistance. US Pharm. 2011;36:42-49. Centers for Disease Control and Prevention. Adult treatment recommendations. Updated March 4, 2016. www.cdc.gov/getsmart/community/for-hcp/outpatient-hcp/adult-treatment-rec.pdf. Accessed October 2016. Stevenson FA, Greenfield SM, Jones M, et al. GPs’ perceptions of patient influence on prescribing. Fam Pract. 1999;16:255-261. Macfarlane J, Holmes W, Macfarlane R, Britten N. Influence of patients’ expectations on antibiotic management of acute lower respiratory tract illness in general practice: questionnaire study. BMJ. 1997;315:1211-1214. Centers for Disease Control and Prevention. Antibiotics aren’t always the answer. Updated November 14, 2016. www.cdc.gov/features/getsmart/. Accessed October 2016.